Looking for a Used Cooper Paceman in your area? CarGurus has 173 nationwide Cooper Paceman listings starting at $7,777. Should you want your ride long on funk (and price) and have little need for practicality, check out MINI’s 2015 Cooper Paceman subcompact 3-door hatchback. Seating 4 folks, with those in the rear on the (very) young side, this oddly attractive MINI rolls on the same platform as its larger and more popular Countryman cousin, but offers less cabin room and, at some 38.1 cubic feet with the rear seatbacks folded, significantly less cargo area. And grocery-toting capability with those rear seats upright is only 11.1 cubes, less than your typical midsize sedan’s trunk. In fact, this curiously value-challenged hatchback, introduced for the 2013 model year, is already rumored to be on the chopping block due to lack of interest/sales. In any case, the Cooper Paceman returns for 2015 in 3 basic trims, the entry-level Base, the up-powered and up-featured S and the top-shelf (as its oh-so-British moniker implies) John Cooper Works, henceforth labeled the JCW. Both the Base and the S are again delivered with standard front-wheel drive (FWD), while the midlevel S is additionally available in all-wheel-drive (AWD) garb and is thereby transformed into the S ALL4 sub-trim. Furthermore, the JCW comes with standard AWD and is, therefore, often referred to as the JCW ALL4. Upgrades to outside appearances for the upcoming model year include standard LED fog lights and running lights for all trims, lightweight alloy wheels, chrome or piano black exterior trim selections and a couple of new exterior color choices, Jungle Green metallic and Midnight Gray metallic. Inside, look for new anthracite-tinted gauges and some added chrome accents in the 2015 Cooper Paceman offerings. But not all the improvements to the 2015 Cooper Paceman are cosmetic. The upcoming S and JCW trims each get a few upgrades to their respective powerplants for some added ponies, thus the turbocharged 1.6-liter inline 4-cylinder (I4) that inhabits both adds some 9 hp to the S and S ALL4 iterations (for 190 hp total), while the JCW’s already up-ticked variation of this blown I4 piles an extra 10 horses (for 218 total) into the stable. Unfortunately, the normally aspirated 1.6-liter engine inhabiting the FWD-only Base Cooper Paceman remains burdened by a tepid output of 121 hp and 114 lb-ft of torque. But hey, fuel efficiency remains a wallet-friendly 28 mpg city/35 highway. All engine offerings are again mated with a standard 6-speed manual transmission, while the 6-speed shiftable automatic transmission, with a driver-selectable Sport mode that adjusts throttle and steering response to suit your inner wild child, remains optional across the board. Furthermore, the S, S ALL4 and the JCW boast steering-wheel-mounted paddle shifters when delivered with the available automatic transmission. As for appearance features and cabin goodies, the 2015 Cooper Paceman returns with such standard adornments as 17-inch alloy wheels (18-inch on the JCW), a rear spoiler and heated power-adjustable mirrors outside, and leatherette upholstery, full power accessories, cruise control and telescoping tilt-wheel steering inside. Also returning to grace this MINI’s aptly described cabin are such standards as manual air conditioning, a cooled storage compartment and a leather-wrapped steering wheel, along with Bluetooth hands-free calling and a single-CD player boasting 6 speakers and auxiliary audio input. The midlevel Cooper Paceman S adds sport front seats, Dynamic Traction Control and standard LED front fog/driving lights to the list, while the JCW tosses in a standard sport-tuned suspension, a sport exhaust system and unique interior and exterior trim upgrades. Most options again come in package form and include a power sunroof, roof rails, a remote garage door opener, rear parking sensors, leather upholstery, heated front seats, keyless entry and ignition, and satellite radio. The yet-imperfect MINI Connected infotainment interface with 6.5-inch display also returns as an option in the 2015 Cooper Paceman, and is slated to play, if not well, at least in a peaceable manner with both the available GPS navigation system and the optional 480-watt, 10-speaker Harman Kardon premium audio upgrade. 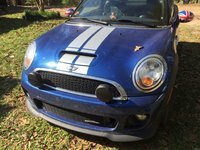 Of course the MINI, in all its various iterations, is all about individualism, thus optional adornments once more include a cornucopia of mix-and-match colors, upgraded and upsized wheels, quasi-individualized graphics and a variety of upgraded cabin material selections to suit one's particular persona. Finally, each 2015 Cooper Paceman iteration sports, besides the usual antilock brakes (ABS), traction and stability control, front side-mounted and side-curtain airbags and a standard post-collision safety system, even as the available MINI Connected system further offers emergency assistance communications. Rain-sensing wipers, heated windshield wiper nozzles and adaptive xenon headlights also return as optional safety equipment. 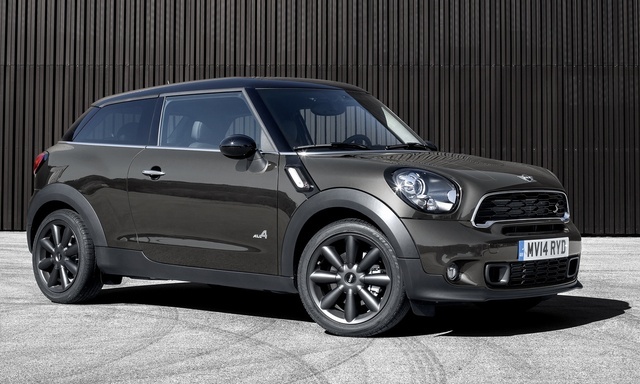 What's your take on the 2015 MINI Cooper Paceman? Celta_691 Love it! Paid $25k for a brand new Paceman S with leather and H-K sound in 2016. Black on black. Looks sharp and drives like a 190 hp go-cart! Last model year for the 3-door. Rear bucket seats are far more comfortable than expected; well worth losing the fifth seat belt. Have you driven a 2015 MINI Cooper Paceman?